You are really pushing it when you have released just one album, then did a extended version and recycle your stuff once more with a live DVD and Blue-ray. The Chickenfoot show at the Dodge Theater in Phoenix, Arizona on September 23rd, 2009 was captured for Get Your Buzz On “Live”. 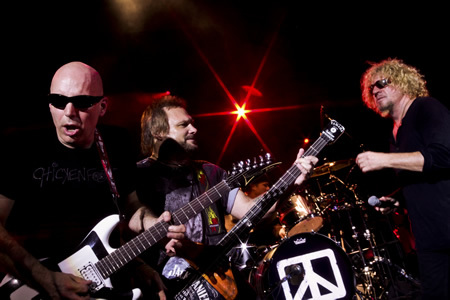 Filmed in high-definition 16 cameras Michael Anthony (bass), Sammy Hagar (vocals, guitar), Joe Satriani (guitar) and Chad Smith (drums) are enjoying themselves immensely on stage. Hagar knows how to handle a crowd, Chad Smith acts as comic relief and Satriani and Anthony go through all the rock poses and moves. Generally following the running order of their album they stretch the set a bit - a bass solo in Soap On A Rope, advanced shredding during Oh Yeah and adding a new intro to Down The Drain. These guys are living their rock dreams to the hilt, grinning like there is no tomorrow. The songs have acquired an edge an urgency that was missing from the studio album - being on stage in front of an audience backed by wall of Marshall stacks obviously helped. When they exhausted their stash of originals Hagar brings out his battered slide guitar for Bad Motor Scooter, the first song that he wrote when he was a member of Montrose in the early Seventies. They close the show with My Generation (The Who) and Satriani playing the Hendrix version of The Star Spangled Banner (which isn't mentioned on the track listing, but it is in the liner notes). It's all over when Chad Smith throws his high hat stand into his drum kit that he had kicked around. Hagar has the last word, telling the crowd "Thank you for allowing us to do this. That is the way rock 'n' roll was supposed to be played". Extras? Besides a photo gallery there is a 50 minutes documentary in which Adam Corolla interviews (and insults) Michael Anthony, Bob Weir chats with Sammy Hagar, and Christopher Guest alias “Nigel Tufnel” from Spinal Tap messes around with a confused Satriani. Chad Smith interviews random people about Chickenfoot, showing them a photo of a band and asking if they have heard of them. It's all in good fun - you can learn how Hagar makes the perfect Margarita and that you need a good old vinyl album housed in a gatefold sleeve to pick the seeds out of your marihuana stash. Get Your Buzz On “Live” is released on Eagle Rock (Europe) and EMI America.